Substantially all of the massive influx of investment in the nation is flowing into the garment and textile and real estate sectors, causing quite a stir in the arena of public opinion. Recently the Nam Dinh Provincial People’s Committee of approved the issuance of an investment license to Chinese garment and textile giant Jiangsu Julun Textiles Group Co.. Ltd to construct a US$68 million manufacturing facility on an 80,000 sq. m area of the Bao Minh Industrial Park. When fully operational, the factory specialising in the production of yarn, will have a total annual production capacity of 9.816 tonnes per annum, suitable for the production of textiles, sewing, crocheting, knitting and weaving. Tran Dang Tuong, the principal stakeholder of Bao Minh IP, said the Chinese manufacturer has an established global reputation and considerable experience in the industry, which has garnered the interest of many foreign suppliers who are now eager to form cooperative relationships with local businesses in the province. In another promising development, HongKong’s Luenthai company, the Vietnam National Textile and Garment Group (Vinatex) and China’s Sanshui Jialida Textile Company held a working session with the leaders of Nam Dinh province, holing preliminary discussions on constructing a multi-million garment manufacturing facility in the industrial park (IP). Covering an area of nearly 1,500 hectares in Nghia Hung district, Nam Dinh province, the IP project has a total projected initial investment of US$400 million and with a target market of developing in such fields as weaving, dyeing, leather, garments and textiles as well as support industries for Vietnam’s garment and textile sector. Pending final approval, the project is expected to begin construction in late 2014. In recent times, the garment and textile sector has attracted investment projects from China, Taiwan, and Hong Kong. Notably, Chinese Texhong Textile Group has invested in two factories in the southern province of Dong Nai with capacity of 500,000 spins of yarns and generated 4,500 jobs in the locality. Subsequently, the group expanded its investment in Vietnam with the addition of a US$300 million facility in Quang Ninh province. Within a year, the project’s first phase has been placed into operation with a capacity of 500,000 spins of yarns, bringing the group’s total spins of yarns to one million (equivalent to Vinatex’s yarn factories). Tuong said that the Chinese garment and textile businesses are accelerating their investment in Vietnam in anticipation of the signing of the Trans-Pacific Partnership (TPP) and lucrative additional market access that comes with it. Foreign businesses are keenly aware that Vietnam’s joining the TPP has a number of highly promising and preferences for the nation. They point specifically to the TPP rule of origin (yarn forward) which requires businesses to use raw materials, supplies and components in the manufacturing process that originate in the same country the manufacturing facilities are located in. Or, in the alternative, import the items from another TPP member nation. This rule provides Vietnam a distinct competitive edge in the garment sector, and is one of the overriding reasons Chinese businesses find the Vietnamese garment sector highly attractive for investment. The significant inflow of Chinese investment in the Vietnam economy has raised an alarm in the minds of many related to an over dependence on Chinese investment and influence, leading some to advocate placing limits on the investment. Bui Xuan Khu, Former Minister of Industry and Trade said that Vietnam should welcome all foreign investors to conduct operations in Vietnam, especially in the garment and textile sector. 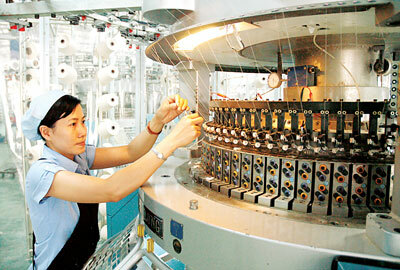 Khu stated that over the past ten years, Vietnam has pursued a garment and textile development strategy. However, the results remained limited due to outsourcing activities. The production of materials for the garment and textile sector has not met the export requirements due to weaknesses in mastering technologies despite modernised machinery and equipment. Factually, Vietnam currently imports over 6 billion metres of the fabric to serve the garment and textile sector each year, while the country has failed to achieve the target of producing even one billion metres of the fabric over the years. Khu added that with the new economic developments in the global marketplace, and in light of the signing of the TPP, Vietnam should welcome the investment inflow, especially from China, Taiwan and Hongkong. These investors will provide the much needed funds to fuel Vietnam’s production of raw materials, components and supplies in the garment sector, generating jobs and taxes to the State, he said. A significant problem of immediate importance is the need to improve state management capacity with the supervision of relevant agencies, so foreign investors are fully informed and ensure compliance with Vietnamese laws, he concluded.